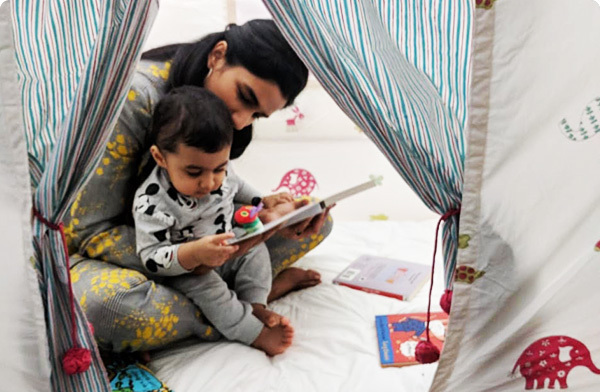 ‘Mom and Me’ program gives mothers and their toddlers, a unique chance to weave a bond and enhance parenting skills, while preparing children for life ahead in a play based, comfortable and safe environment. The program allows mothers and children to discover and learn new things ‘together’ and help build confidence in their interpersonal, social, linguistic and intrapersonal skills. It aims at making learning a fun filled activity for the growing child while involving the mother at every step of learning. Components like music, movement, rhymes, songs, story, messy play, art, games add the element of joy and excitement making their first contact with a secondary environment a memorable one.